For your convenience, Tri-City Process Servers has provided a brief sampling of the Haque Convention with regard to service of process. There is a good web site that you can use. Please feel free to access this site through the following hyperlink listed below. Please consider using our Ontario Process Serving Team for all your litigation and process serving needs. CALL TODAY and see why our professionals are First Class and All About Service! "The most direct way to serve American legal documents in Canada is by forwarding duplicate sets of the documents in English directly to the Process Server in whose judicial district you need service effected"... "The cost for this service varies depending on the number of attempts at service. When there is no urgency and no difficulty locating or serving the person to whom the documents are addressed, the Process Servers services are generally least expensive and simplest to effect." "...it is usually more effective to retain a licensed private process server and, if the whereabouts of the person to be served are unknown, a private tracing service may be used. Firms providing these services are listed in Canadian telephone directories under "Process Servers"/"Huissiers Exploitants" and "Tracing Bureaus." 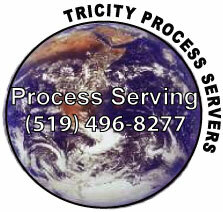 Private process servers are the most expeditious agents for effecting service of foreign legal documents in Canada."